John Calvin was born in France in 1509 and was raised as a Roman Catholic. His father initially intended John to enter the priesthood, but realized later in life that there was more money to be made in law, and so in 1525, sent John to become a lawyer. It was during this time that the ripple effects of Martin Luther’s 95 Theses (published in 1517) were beginning to be seen throughout all of Europe. In 1533 John Calvin experienced his conversion, and later that year, one of John Calvin’s close friends, Nicolas Cop, publicly sided with the Reformers in calling for changes in the Roman Catholic Church. As a result, Cop was condemned by the Catholic Church as a heretic, and was forced to flee for his life. Calvin was also implicated in the condemnation and was also forced to go into hiding. In 1536, Calvin published his first edition of the Institutes of the Christian Religion, which was initially intended to be a short explanation and defense of the teachings and ideas of the Reformers. The book went through numerous subsequent expansions over the course of John Calvin’s life. A short time later, during one of his travels, John Calvin traveled to Geneva, and a man there named William Farel convinced John to stay and help reform the church in Geneva. He agreed, and in 1537 he was selected to be a pastor of the church. However, by the end of the year, the church council forced Calvin to resign his position and leave Geneva because he wanted to force church members to sign his doctrinal statement and articles of church organization (which few people wanted to do), and because he refused to serve communion with unleavened bread on Easter Sunday. Calvin traveled to Strasbourg, which was a city of refuge for Reformed people, and over the course of the next three years, preached and taught in three different churches. He also worked on an updated version of the Institutes, and published his Commentary on Romans. During the time, the church in Geneva dwindled in size, and was facing pressure by the Roman Catholic Church to return to Catholicism. By way of response, the Genevan church called upon Calvin to write a letter in their defense, which he gladly did. They were so pleased with his letter, they asked him to return to Geneva and take up the pastoral position once again. In 1541, Calvin returned to Geneva under the condition that the church accept and adopt his proposed reforms. They agreed. 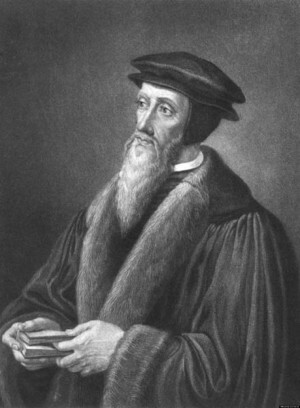 Calvin ministered in Geneva for the rest of his life, until he died in 1564. The first few years of his ministry were busy and productive. He preached an average of five sermons a week, and wrote numerous books, tracts, as a well as a set of commentaries on almost every book of the Bible. However, his ministry in Geneva was not without opposition. Not all agreed with Calvin’s teaching and theology, and many accused Calvin of teaching false doctrine. From 1546 to 1553, Calvin’s power and influence steadily waned. There were frequent attempts by both sides of the debate to undermine, arrest, and even kill members of the other party. As one example, a man named Jacques Gruet was arrested and, under torture, confessed to writing an anonymous letter in opposition to the church leaders. Gruet was beheaded in July of 1547. Eventually, the opposition to Calvin became so fierce, that in July of 1553, Calvin offered to resign his position a second time. His request was refused, because those who opposed him knew that an uprising and church split would likely occur if they accepted Calvin’s resignation. One month later, in August of 1553, all of Calvin’s fortunes changed when a man by the name of Michael Servetus arrived in Geneva. Servetus also was a Protestant Reformer, but had been condemned as a heretic by both Catholic and Protestant church leaders for his writings against the Trinity and infant baptism. Though Calvin and Servetus had debated these issues by letter for many years, they had never met in person, yet when Servetus stopped in Geneva on his way to Italy, he was recognized and arrested. A trial ensued, in which Servetus was once again condemned as a heretic, and on October 27, 1553, was burned at the stake on top of a pile of his own books. 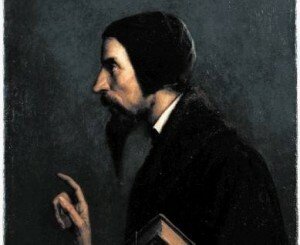 As a result of his involvement in the arrest, trial, and execution of Servetus, John Calvin was acclaimed across all of Europe as a defender of Christianity. Over the next two years, his power and fame grew as never before, and in 1555, all who had previously opposed John Calvin either fled Geneva or were rounded up and executed. From 1555 until his death in 1564, Calvin’s position, power, and reputation went almost completely uncontested. He did experience some controversy with Martin Luther over the issue of consubstantiation, but even this controversy with Martin Luther—the “father” of the Reformation itself—only solidified Calvin’s position of prominence in the minds of many. During these final years, he continued to write, preach, and teach, and he also founded several schools, including Calvin College (Collège Calvin) in Geneva, Switzerland in 1559. In 1558, he finished his final edition of the Institutes, and he preached his last sermon on February 6, 1564, before dying on May 27, 1564. After his death, Theodore Beza took over Calvin’s position in Geneva and helped carry on his work and ideas. This is obviously a very short and summarized history of John Calvin’s life. For those of you who have studied John Calvin, do you have anything to add? For those who didn’t know much about Calvin, what are your initial impressions from this brief account? Let us know in the comments below. I’m so glad instigating trolls, the uninformed and passionate, the informed and passionate, and easily influenced by others engage in today’s religious disagreements with the weaponry of blogs and comments. Beyond pondering how is my life like or not like Calvins, or like or not like Jesus of Nazareth, how is my life like or not like their and others’ peasant followers. ??? – Not sure if you are joking, criticizing, mocking, or just having fun? All I know is that I wouldn’t want to go anywhere near Calvin’s Geneva. However much I have against him as a person, though, I have to remind myself that even a man after God’s own heart like King David can fall, and fall HARD. And even someone as wise as Solomon can fall into error. During the Reformation, the onkt Christians thst were “safe” from prosecution, were those that were outside of Europe. Preferably as far from Europe as possible. Japan, for instance. That should be Only, not Onkt. I shouldn’t rely on the spellchecker here. It’s an interesting coincidence that the Reformation, which brought the whole of Europe into civil war and lead to mass migration happened a mere 25 years after Columbus “discovered” America. Coincidence? Plantationism is a colonial policy with a very black history.The British colonized Australia and New Zealand by forcibly sending prisoners. In fact Britain continued to send poor and orphan children to Australia and Canada, even until 1968 (link below). The Chinese are carrying out a similar plantation policy in Tibet now. Israel was of course formed by plantation just after World War 2, with the jewish holocaust acting as a catalyst. Even so, most Orthodox Jews still remain opposed to the state of Israel on religious grounds — without the holocaust there’s no way that Israel would have been formed (link below). Just as, without the wars caused by the reformation it’s hard to see how the Americas would have been colonized. If one is open to this conspiratorial view of history, there is some weight to the notion that the whole reformation was in fact an orchestrated policy to create mass European migration into the Americas. Where would that leave Protestantism as a religious movement? Unthinkable? Currently european and north american nations are being de-Christinized, not only by attacks from science and the arts, but also by the plantation of immigrants with other faiths, most notably Muslim and Hindu beliefs. This statement has nothing to do with john Calvin, Calvinism, or the Reformation. Besides which, it is factually in error, as the British created what would become Israel in 1922 as a result of World War I. We do not all share world views but are not privy to our own facts. Our interpretations of those facts may be different, however we need to stick to the topic at hand. “On May 14, 1948, David Ben-Gurion, the head of the Jewish Agency, proclaimed the establishment of the State of Israel. U.S. President Harry S. Truman recognized the new nation on the same day…. The British, who held a colonial mandate for Palestine until May 1948, opposed both the creation of a Jewish state and an Arab state in Palestine as well as unlimited immigration of Jewish refugees to the region.” U.S. department of State, Office of the Historian. I don’t like the rudeness of your comment with it’s implication that I was either knowingly or unknowingly lying, or your call for censorship. If a speculative theory offends you, just ignore it — it’s speculative, or try replying with truthful and intelligent argument. Don’t bear false witness. Th Balfour Declaration more or less falsifies the etire hypothesis you present. Also note the the muslim countries, all of which broke their promise to their own citzens, The British Commonwealth,Isreal and the Trans-Jordian citizens whose citizenship was unilaterally revoked by Jordan, were the obstacle in creating a homeland for Jews. FWIW, the US department of State has been anti-Jewish, since at least the 1890’s. As such, their statements regarding Jews and Isreal need not e congruent with either the documented nor undocumented evidence. The Balfour Declaration supports my “thesis”. It shows that there was a plan to establish a Zionist state well before WW2. Can’t follow your logic. Your reaction is extremely strange to a very speculative thesis which I myself don’t give much thought to but just find interesting. Your attempts to dismiss it are too weak. I might write my own rejection of my speculation, as you seem to need the help. it seems that you’e reacting, not thinking. That’s what makes it interesting. Blow the thesis out of the water, I’m happy if you can, but do so intelligently. There is a difference between what individual agencies of a government do, and what the legislative branch of the government says they do/should do, and what the administrative branch says tney do/should do. Yeah, there was a lot of Christian-on-Christian bloodshed during the Reformation. Makes you wonder a bit, doesn’t it? When religious authorities have political authority, bloodshed is the inevitable result. It does not matter what the religion is. It does not matter how much political authority the religious authority has. The only thing that matters is that some political authority is held by religious authorities. That is right. This is why Jesus said, “My Kingdom is not of this world.” In other words, it does not operate with political or military power, the way the kingdoms of the world do. State-sanctioned religion is nearly always used to justify state-sanctioned violence. Still, we should strive to elect Godly men who will pass Godly laws. You’re not going to want to hear this but my first thought in reading this was “oh my. There’s a lot of Christians killing other Christians, likely in Gods name.” So does this bring us back to that which you are taking a break from. Yes there is a little jest involved. Well, it was a turbulent time in history, but Calvin’s off-with-their-heads approach to theological orthodoxy doesn’t do much for so-called Calvanism. There didn’t seem to be a lot of love for one’s enemies there, but who are we to judge? Ever hated; ever called someone a fool? You’re gone too. (Massive oversimplification, but you get the idea). But we do need to think about what the conventional approach of the day to theological unorthodoxy was, and how much of a moving platform non-Catholocism actually was. But our enemies in the east–Isis are murdering thousands of innocent people all the time. I want to make them stop. Just wondering about “all who had previously opposed John Calvin either fled Geneva or were rounded up and executed.” Were ALL who opposed/remained executed? Perhaps, all who had PUBLICLY opposed Calvin? I imagine many just kept quiet. Yes, you are probably right about those who remained. I don’t have a list of names, sadly, or what they said. Thanks for notifying me of the typos. They are now fixed!